If you have browsed FishTankBank for any amount of time, you may realise that we have a penchant for Asian culture. The chilled out atmosphere that this part of the world exudes leaves us feeling like we need to escape our current environment. Moreover, we love getting oriental ornaments for our fish tank, to try and bring some of this relaxing atmosphere to our fish. 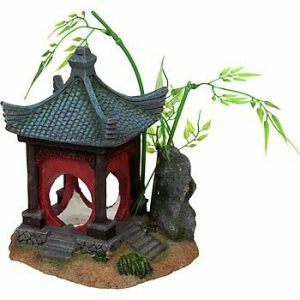 This gazebo just screams oriental culture, and is a very well made little ornament that will look right at home in your fish tank. It’s only a few inches tall, so won’t take up too much room in your fish tank, but still provides a nice little piece of decoration that your fish will love. We certainly think it’s great, and is great value for money too. Also, it has a ton of positive reviews over on Amazon, so go check them out by clicking the green button above! Anybody who has ever tried to grow a bonsai tree knows what a great addition they can be to any house, which is exactly why we love this fish tank bonsai tree. 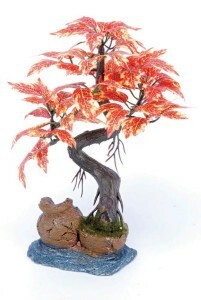 As decoration, they can give an authentic oriental feel to any aquarium. They also provide hiding places and coverage for your fish, which they will absolutely love as it resembles their natural habitat. It’s about 8 inches tall, so would act as good decoration around the borders of the tank. It’s another item that has lots of positive reviews over on Amazon so click the green button to check some of them out! This statue is a great addition to any fish tanks that just need to chill out a bit. The life of a fish can sometimes be a bit hyperactive, so Buddha is the perfect dude to bring things down a notch, and spread some relaxing vibes. We love this statue because it has a bronze effect that looks great and very real. It’s also the perfect size for a smaller fish tank, so won’t intrude on your fish’s space. Plus, it can actually provide a new point of interest and a hiding place for your fish, which is always fun. As with all of the products on this list, it has a great average customer rating over on Amazon, so be sure to click the green button above and check out some of the reviews. Besides noodles and Buddha, bamboo shoots are one of the first things that pop into my head when I think about Oriental culture. They are synonymous with the food and nature of Asia, and have always been incorporated into their daily lives, whether it be for eating or for decoration. 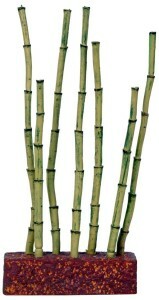 Adding these bamboo shoots yo your fish tank can be a great way to add an oriental feel without being too flashy! Fish will enjoy their natural appearance, and will get hours of fun from swimming around and hiding in between the shoots. The company that made these shoots also has a ton of other ornaments over on Amazon, which you can find by clicking the green button above. This will also show you the positive reviews that the product has. So there we have some great oriental ornaments that can spread some cool vibes around your fish tank and hopefully help your fish chill out a bit. All of the ornaments that we have included in this list are selected based on their overall quality, average customer rating and value for money, so we hope that they tick all of these boxes for you. All of the items above are handled and dispatched through Amazon, so you can be safe in the knowledge that your delivery will get to you safely and efficiently. ‘Oriental’ generally means anything belonging to the East, which can include Asia and the Middle East, in relation to the location of Europe. 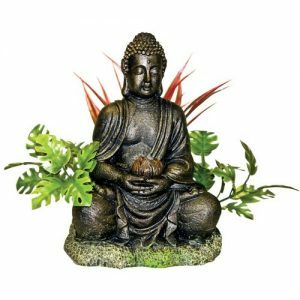 We have chosen items which are usually associated with Asia, because we found that the best decorations on offer where generally related to Asian themes, such as bamboo and Buddha. These items were chosen due to their high quality, which is based on their appearance and durability, as well as their value for money. Perhaps the most important factor when choosing items for FishTankBank is the customer reviews, as these are real people with real opinions. Feel free to take a look at some of the other products that we have on FishTankBank.